I just applied for my Masters program. Then I ate five brown sugar cookies to dull the pain. But the pain is still there. Ouchie. No matter how I feel about becoming a better reading teacher for K-12 (which happens to be awesome), I do not feel awesome about going back to school. How did this happen?! I thought I was done. Sob. But I also thought I didn’t like sugar cookies. And things turned out alright. Would this be a good time for a confession? I just really don’t love sugar cookies of the frosted cut out Santa, snowflake, or Christmas tree variety. I just can’t seem to crave them with the same passion that I crave holiday Minty Chocolate Truffles or Salty Toffee. Then, I made these brown sugar cookies. After giving permission for Bjork to eat 2 heaping spoonfuls of the dough, and giving permission for myself to eat unlimited dough, I sat by the fire sipping hot chocolate and eating a perfectly lightly crunchy-on-the-outside, chewy-on-the-inside cookie glittering with sugar crystals. And I felt happier than a pug in a rug. That was all before I applied for my Masters degree. Er, program. Whatever. It’s all just a blur after that. If I may boss you around for a moment, it’s time for you to make these cookies right now. They remind me of a cross between a classic sugar cookie and a snickerdoodle without the spices. They have a warm buttery flavor with an out-of-this-world light, soft yet lightly crispy buttery texture. I love butter. And can I just say two very important words to you right now? AMAZING. DOUGH. 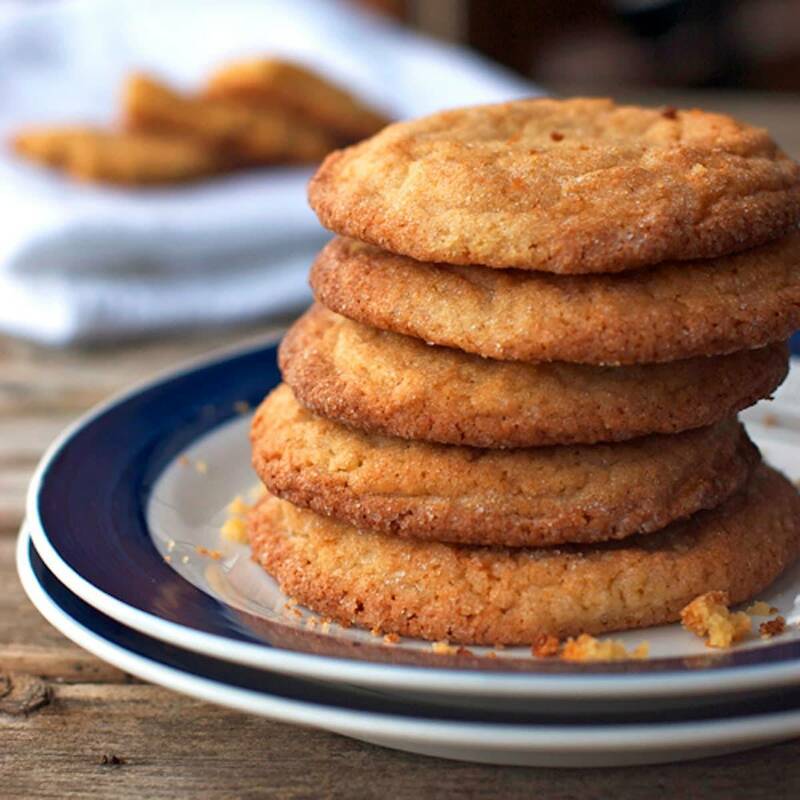 These simple brown sugar cookies are crunchy on the outside and chewy on the inside. A favorite recipe from a family friend who is a caterer! Cream sugars and shortening. Mix in the egg, then add dry ingredients. Use a cookie scoop to form nice round balls and roll each dough ball in white sugar. Don’t flatten. My favorite time to eat them was 1) before they were baked, and 2) immediately after they were baked. For better or worse, after a few hours they will become more crispy, like a traditional sugar cookie. 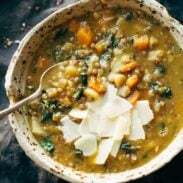 This recipe comes from a good family friend, Vicki, who owns and operates a catering business with her husband. Basically anything she makes turns to edible gold. She’s the real deal. Maybe I should pursue a Masters in catering. With a specialty in brown sugar cookies. Hubba hubba… I want some! Mine always come out flat and crispy when I make them… Help me! I like the “pug in a rug” reference. Are you getting a pug for Christmas?? What an awesome sounding cookie! These cookies sound just perfect! I can’t imagine going back to college now – you have my deep admiration! Congrats (or I’m sorry) for applying, haha. Good luck with that! I think you did the right thing by eating five cookies. I’m not much for the frosted cut out sugar cookies either but these look different and better. Can’t wait to try! Oh, these do look yummy! Brown sugar makes everything INFINITELY better. I am in love with brown sugar. Grainy, sweet, crumbly, and just the right amount of sticky… ahhh. Good for you! I’m just using that mantra for the cookies. 🙂 Are you thinking about pursuing your Masters, too? Sounds fantastic and like these cookies could take the edge off anything. I found/find grad school so much more rewarding (though totally crazy) than undergrad. Hopefully you like it! I didn’t even think of that! Genius. Congrats on applying for your master’s program! I’m thinking I’ll be doing a lot of baking (and dough-eating-justification) like this when I apply for mine. 🙂 These cookies look like perfection! grad school is tough – but you can handle it! and thank you for this recipe – now these cookies can help me get through a couple weeks of it! Congrats on applying for your master’s! I know how you feel- after I turned in my apps for my doctoral program I had a moment of “what the hell did I just do” and unfortunately, I did not have these beautiful cookies to console me! Doctoral program? oh my goodness. You deserve at least 3 batches of these cookies. I have to make these for my husband! I recently made “sour cream cookies” and he has been loving them! He loves the plainer, sugar cookies! lol… so does Bjork, as evidenced by the tube of refrigerated cookie dough that he is currently finishing off. Oh my, these look beyond yummy! I’m in my first semester of my (early childhood ed) Master’s and – believe it or not – its pretty great! It’s MUCH better and more interesting to take classes about things you’re actually interested in/are relevant to your life. You can do it!! Yes! These look soooo good! I need to make them asap! I might have to use this recipe for an upcoming bake sale at work! They look so lovely! These sound amazing! When I make cookies I have to protect the cookie dough otherwise it gets gobbled up before the cookies can get made! I love brown sugar cookies…but am not a huge sugar cookie gal either. The thought of these by the fire is making me happy…and jealous of your fireplace! Congrats on applying for your master’s program! I began mine last summer…and had graduated 4 years before. It’s definitely a tricky transition. I ended up deciding to only take summer classes. Somethings should be a process. I think I used finances as an excuse. Whoops? Congratulations on signing up for your master’s! It’ll all be worth it when you’re finished! I hated getting mine but it was well worth it when I was able to learn more about becoming a better teacher and the pay bump didn’t hurt either! You can do it! And these cookies…. they speak to my heart… or is my belly? I don’t know but I’m making them because I love sugar cookies! Going back to school is SO fun, you’ll love it 🙂 I love being “old” in undergrad at 27…the years of working somehow put schoolwork in much better perspective, and you’ll have somehow grown smarter without even having realized. Also, brown sugar is my bath salt. Or sugar. That is to say, I love it. LOL – brown sugar is my bath salt, too. You convinced me (as a fellow person who doesn’t really crave sugar cookies) to try these cookies! And congrats for getting your Masters Degree. I did it last year and it’s so worth it! I love hearing from people who have also done their Masters! It’s possible!! These cookies look great, amazing photos! And congratulations on the Masters program! That cookie looks fantastic. I bet it tastes just delicious. Come visit. We have pretzel Heath bark this week.